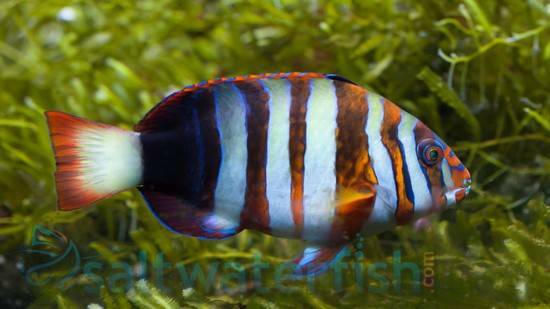 The Harlequin Tusk, Lienardella fasciata, is a wonderfully unique aquarium fish. 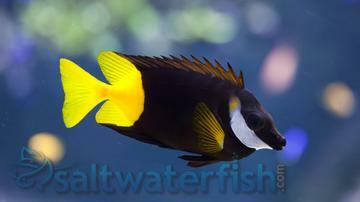 They exhibit the most vibrant orange colors found on any fish and beautiful white vertical striping. Neon blue and green stripes can often be found across their faces. Harlequin Tusks possess large teeth that they use to crush small crustacean prey. 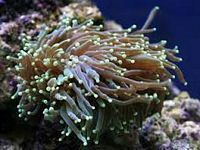 Like other unique large fish, there are some specifications that should be heeded while keeping a Harlequin Tusk. They should usually be kept in a fish-only aquarium with only one Tusk per tank. This is advised in caution against in-fighting between individuals and preying on small inverts. 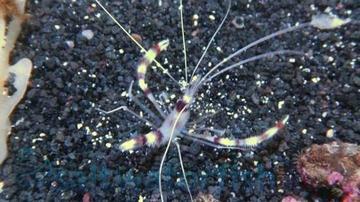 Harlequin Tusks should be fed a diet of crustaceans, shellfish, or fleshy inverts. Initially, they may need live frozen feeders until they are acclimatized. 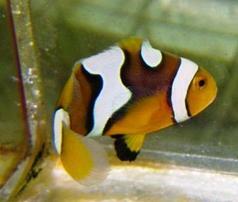 If cared for properly, the Harlequin Tusk can be one of the most exuberant fish in your tank. In the wild, the Harlequin Tusk can grow up to ten inches. Harliquin tusk is big. Really big and really fat. Hes a bit on the shy side right now but Im sure over time he'll be happy and swimming all over his new home.